Now that the app can receive push notifications, we need to make sure that the Mattermost Push Notification Service is able to send the notification to the device. This guide will focus on installing and configuring the push notification service. A linux box server with at least 1GB of memory. A copy of the Mattermost Push Notification Service. Custom Android and/or iOS Mattermost mobile apps. Private and public keys obtained from the Apple Developer Program. A Firebase Cloud Messaging Server key obtained from the Firebase Console. For the sake of making this guide simple we located the files at /home/ubuntu/mattermost-push-proxy. We’ve also elected to run the Push Notification Service as the ubuntu account for simplicity. We recommend setting up and running the service under a mattermost-push-proxy user account with limited permissions. in the previous command vX.X.X refers to the release version you want to download, see Mattermost Push Notification Service releases. If you are upgrading a previous version of the Mattermost Push Notification Service make sure to backup your mattermost-push-proxy.json file before continuing. Configure the Mattermost Push Notification service by editing the mattermost-push-proxy.json file at /home/ubuntu/mattermost-push-proxy/config. 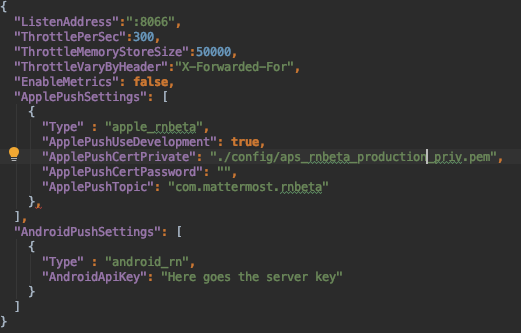 Follow the steps in the Android and iOS sections to replace the values in the config file. Start the process with sudo start mattermost-push-proxy or if the process is already running with sudo restart mattermost-push-proxy. Go to the Firebase Console and select the project you’ve created. Once in the dashboard, go to the project settings and select CLOUD MESSAGING. Look for the value of the Server Key and copy it. Double click the Distribution Certificate generated while Setup Push Notifications for iOS to add it to your Keychain Access. Go to Keychain Access, select the login keychain and My Certificates from the side menu. 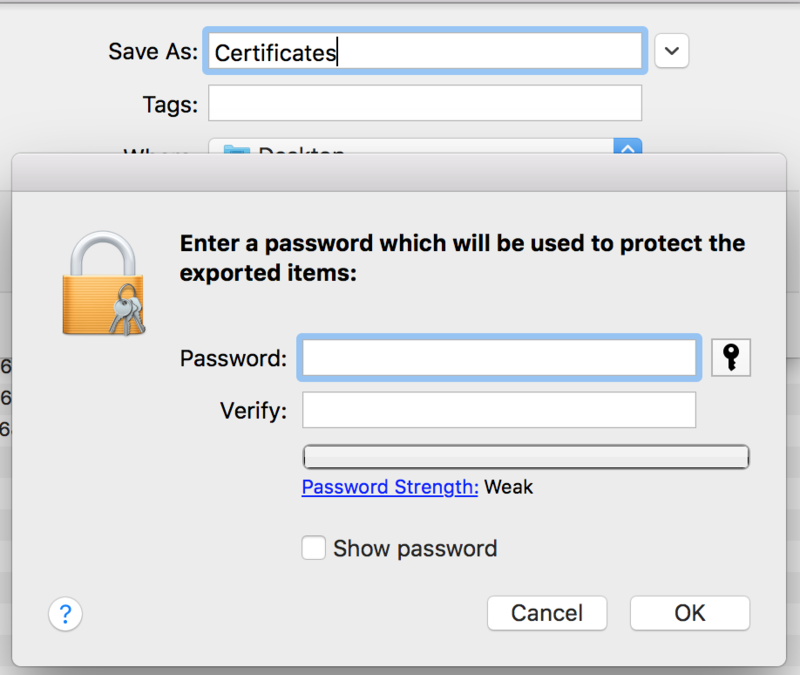 Extract the private key from the certificate you exported .. In you Mattermost instance, enable mobile push notifications. Go to System Console > Notifications > Mobile Push. Under Send Push Notifications, select Manually enter Push Notification Service location. Enter the location of your Mattermost Push Notification Service in the Push Notification Server field. (Optional) Customize mobile push notification contents. Select an option for Push Notification Contents to specify what type of information to include in the push notifications. Most deployments choose to include the full message snippet in push notifications unless they have policies against it to protect confidential information. Finally, start your Mattermost Push Notification Service, and your app should start receiving push notifications. Remove the `apple:`, `apple_rn`, `android:` or `android_rn:` prefix from your device ID before replacing `DEVICE_ID`. Use that prefix as the `PLATFORM` (make sure to remove the ":"). You can also verify push notifications are working by opening your Mattermost site and mentioning a user who has push notifications enabled in Account Settings > Notifications > Mobile Push Notifications.